For first-time visitors we recommend a stay in or around Times Square. The area is very convenient for its proximity to a lot of attractions, as well as transportation options. It’s easy to get to any corner of NYC from Times Square within an hour. If you’re an experienced visitor to New York, or you want to venture out of the tourist hot-spot, look for hotels or Airbnbs Downtown or in other Boroughs. 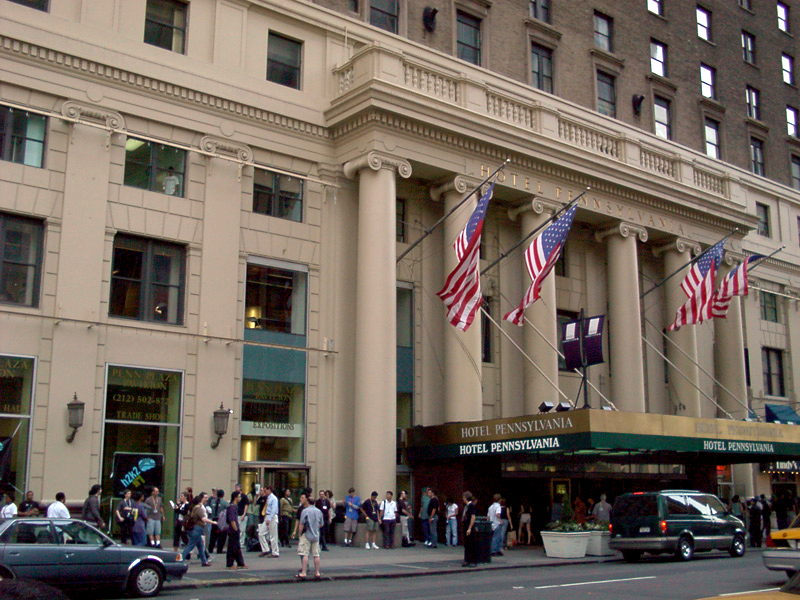 Hotel Pennsylvania is a popular option for budget travelers. This Midtown hotel is no frills but offers cheap rooms, free WiFi and access to a gym. Hampton Inn Downtown If you don’t mind staying in the Financial District, the Hampton Inn offers rooms for about $100/night. This chain hotel offers standard rooms, in the quality you’re used to in all other hotels in the franchise. Another good budget option is renting an Airbnb in Brooklyn or Queens. For under $100/night you can get some sweet deals. 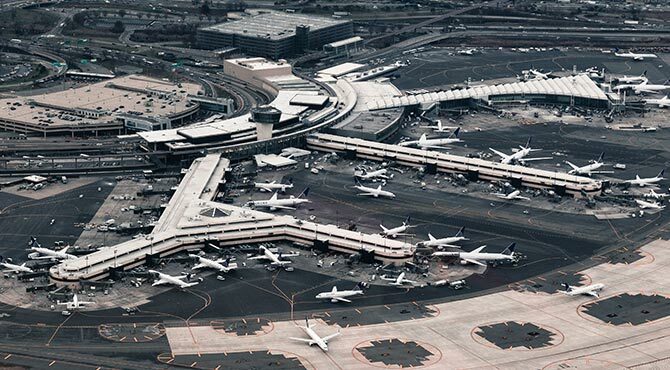 If you’re looking to splurge on your New York City experience, there are plenty of options for you to choose from. 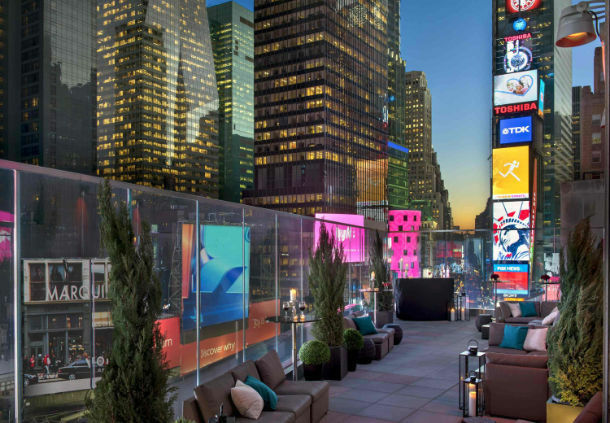 The Marriott Marquis right in the middle of Times Square offers rate from $269/night and the ultimate comfort after a long day of walking and sightseeing. Italian style meets functionality in the Michelangelo on 7th Avenue and 51st St. Experience the luxury in one of the bet 4 star hotels in Manhattan. Manhattan can be divided into three areas, Downtown, Midtown and Uptown. Midtown is the epicenter of New York City tourism and business. Glass skyscrapers grace the skies and the streets are always busy with crowds. Midtown is home to Times Square, the Empire State Building, Bryant Park, Theater District, Rockefeller Center and Grand Central Terminal. 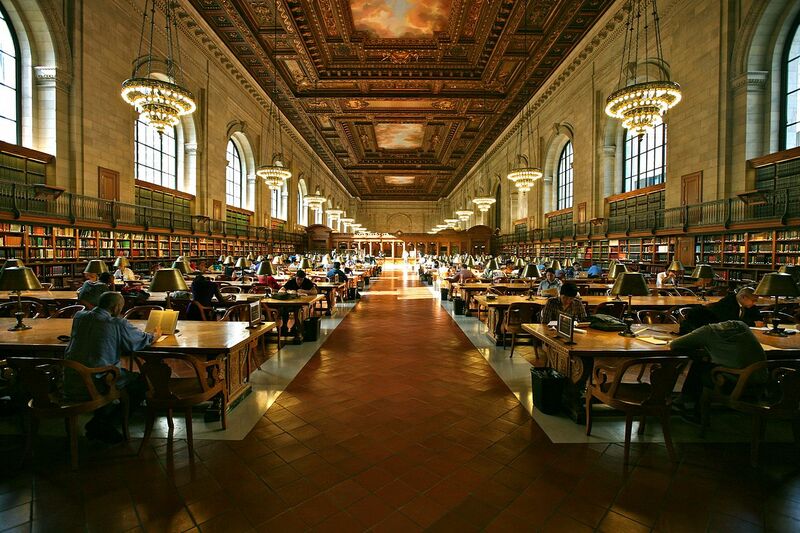 You can easily spend all day exploring Midtown Manhattan. Our favorite way to start is by visiting Top of the Rock. The observation deck on top of 30 Rockefeller Plaza offers arguably the best views in the city. It’s open from 8am till Midnight every day. When you get there, with your pass or otherwise, you will likely receive a timed ticket for a time of your choice. If you want to come in during popular times, such as sunset, make sure you arrive with ample time. 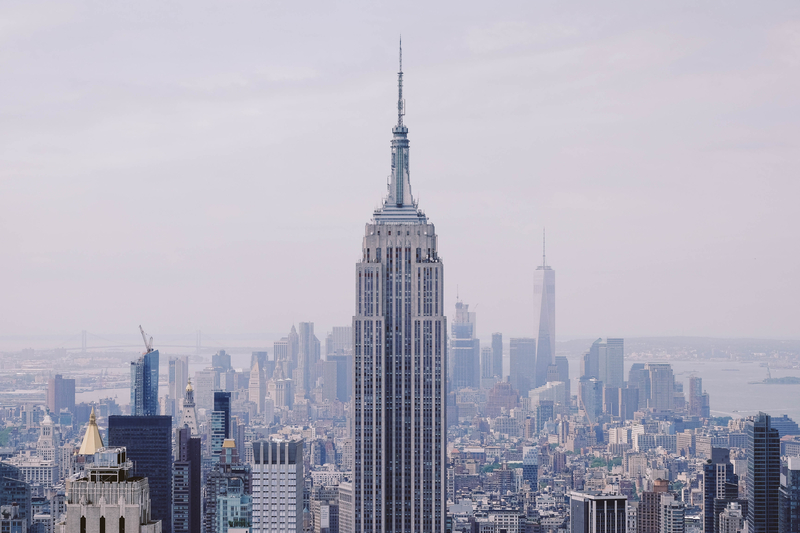 Once you’re up there, you can enjoy a spectacular view of Downtown or Uptown and Central Park in the outdoor observatory and spend as much time as you’d like. One of the world’s busiest train stations transports almost 700.000 people every day. It is also one of New York City’s most impressive landmark. The majestic interior of the main concourse and the Astronomical Ceiling have served as a setting for many romantic scenes in film, as well as serve as a platform for emotional hellos and good byes of regular commuters daily. The largest piece of grass in all of Manhattan save for Central Park. 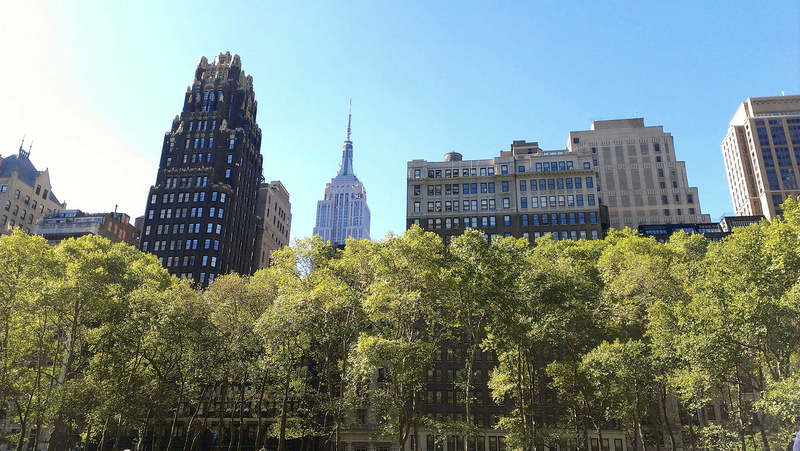 Bryant Park serves as an oasis to office workers in the area, as well as a much-needed resting place for Midtown Tourists. The East side of the park on 5th Avenue is occupied by the New York Public Library’s main branch, another one of New York’s famous landmarks. Between 5th and 6th Avenues, you will find the famous Rockefeller Center, home to the iconic Christmas Tree and ice skating rink in the winter and a restaurant and a platform for public art in the summer. 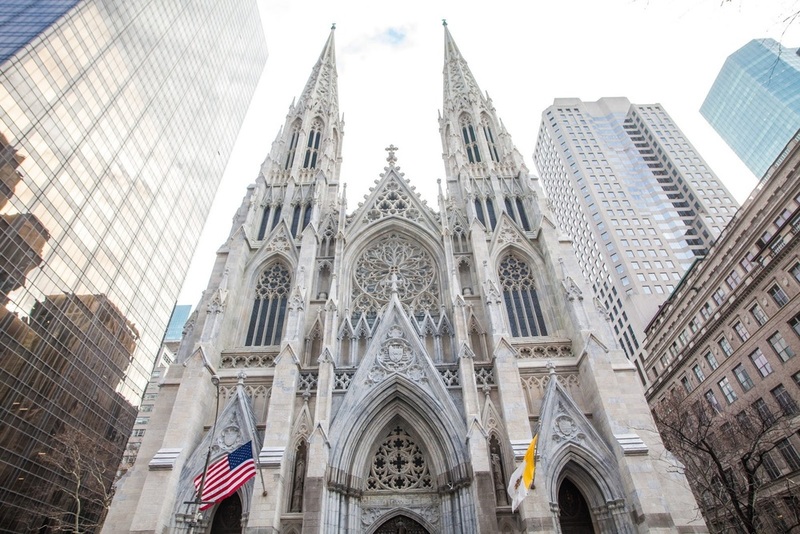 On 5th Avenue you can find the beautiful St. Patrick’s Cathedral, one of New York’s most beautiful churches. The seemingly out-of-place Neo-Gothic architecture is accentuated by the surrounding modern glass skyscrapers. 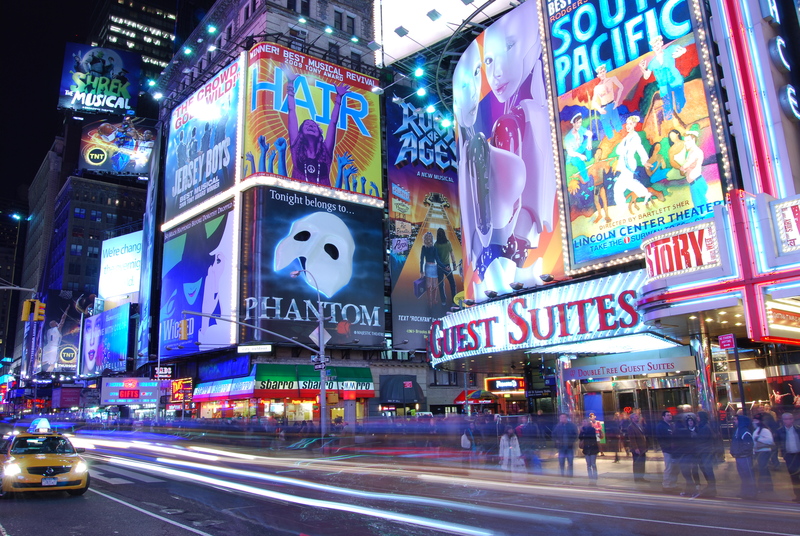 After walking around Midtown, sit down at one of New York City’s theaters and enjoy a Broadway show. New York’s Broadway is the home to the largest musical theater scenes in the world and belong on any itinerary. There are always many shows to choose from, from long-running classics like Fiddler on the Roof to brand new productions debuting this year. Buy your tickets at broadway.com or get same-day rush tickets in person at the TKTS office in Times Square. Times Square at night is an undeniably magical experience for first-time visitors. The glowing neon ads, the energy of the people swarming about as well as the grandiose of the surrounding skyscrapers create a powerful environment that melts the hearts of first-time visitors every day. 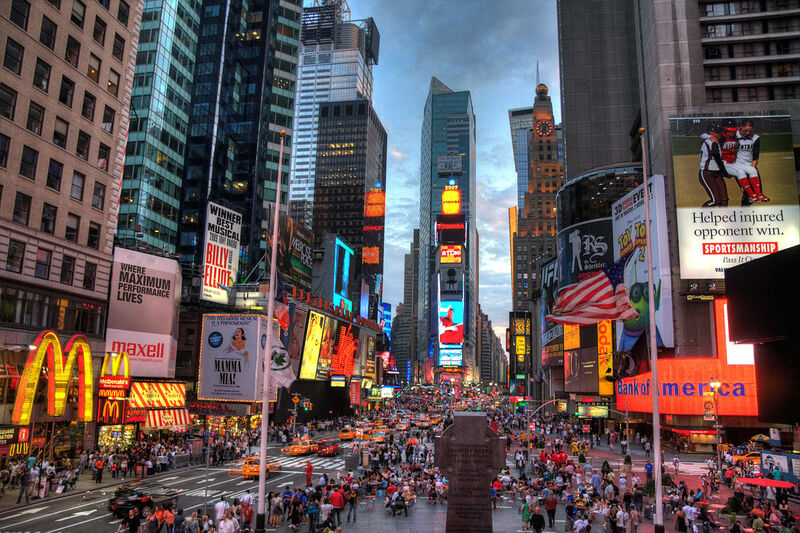 Spend some time in Times Square and take it all in but we recommend venturing outside of it to eat or shop. Shop Downtown in SOHO and eat in West Village or further uptown for more authentic experiences. 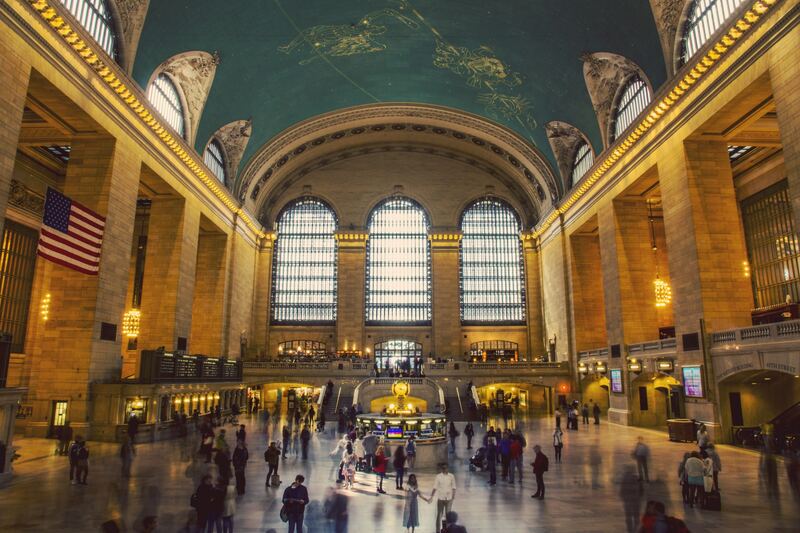 Take the subway or hop-on, hop-off bus Downtown and spend some time exploring this area, home to the Financial District, the 9/11 Memorial, Statue of Liberty and much more. Much like the Empire State Building, the Statue of Liberty holds a firm place on bucket lists all over the world. For first-time visitors, which one is often non-negotiable. As such a popular attraction, accessible by boat only, space gets pretty competitive. If your heart is set on visiting the crown, prepare to make a reservation months in advance. If you’re cool with hanging out on Liberty Island and walking around the statue, tickets are typically available same day. The ground ticket is also available for free with the SightSeeing Pass. 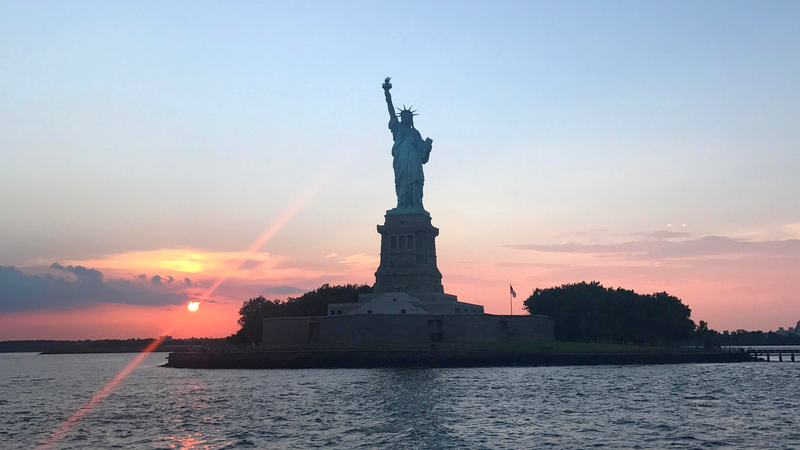 Statue Cruises is the only company that provides ferries to Liberty Island and Ellis Island. If you’re not set on setting foot on the islands, you can take any Downtown cruise and get close, without the crowds and time commitment. New York Water Taxi, Manhattan by Sail or the free Staten Island Ferry are all good options. If you take the Statue Cruises ferry, we recommend you get there around 7:30am to take the first ferry at 8:30am. The Ground Zero of the September 11 attacks is now dedicated to a memorial of the events. 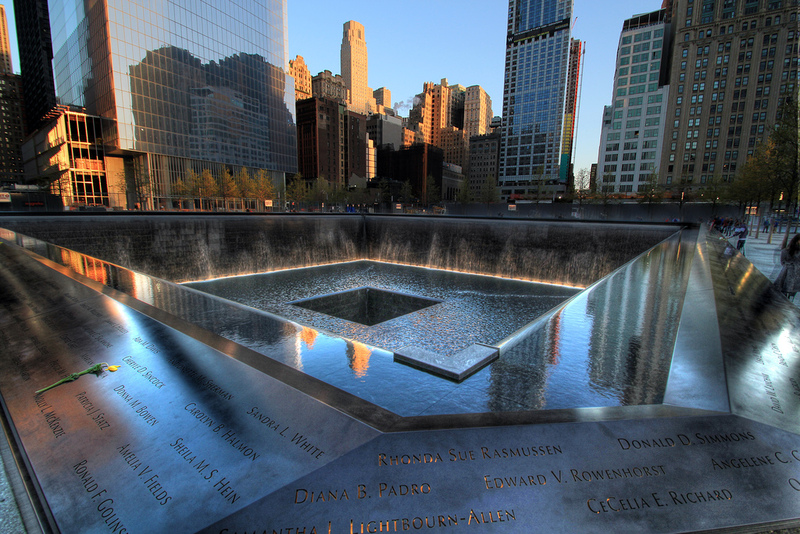 The two square pools commemorate the events and bring tears to the eyes of visitors every day. Underneath the memorial is the massive 9/11 Museum, featuring artifacts and stories from 9/11. Around the corner at 92 Greenwich St, you can find the 9/11 Tribute Museum, a newly opened space dedicated to the telling of the stories of 9/11 through emotional testimonies and artifacts from the events. The epicenter of US finance lies in Manhattan’s Wall Street and Financial District. The famous New York Stock Exchange is here along with a multitude of banks and other financial institutions. The neighborhood itself is exciting because of its eclectic architecture and history. Side by side you can find modern glass skyscrapers and old historical churches and tenements, while the narrow crooked streets lead you astray but add to the charm of the neighborhood. Th best way to explore Wall Street is by taking a walking tour. 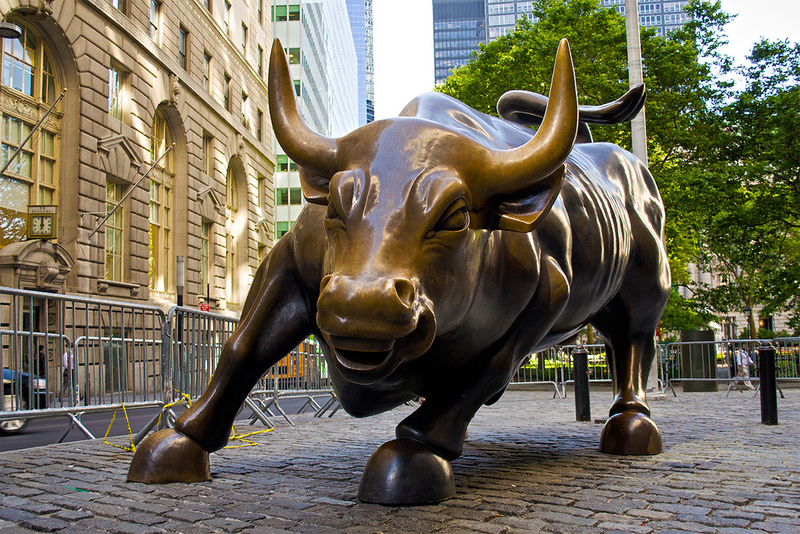 Consider Wall Street Walks for an in-depth overview of the area. Of the three main observatories in New York City, One World Observatory is the highest up and the only one offering a view from Downtown Manhattan. The Observatory is located between the 100th and 102nd floors and is accessible by a high-speed, state-of-the-art interactive elevator which offers an exciting experience on its own. One World Observatory tickets start at $34 for an adult. The SightSeeing Pass is the only pass that includes a free admission into One World. 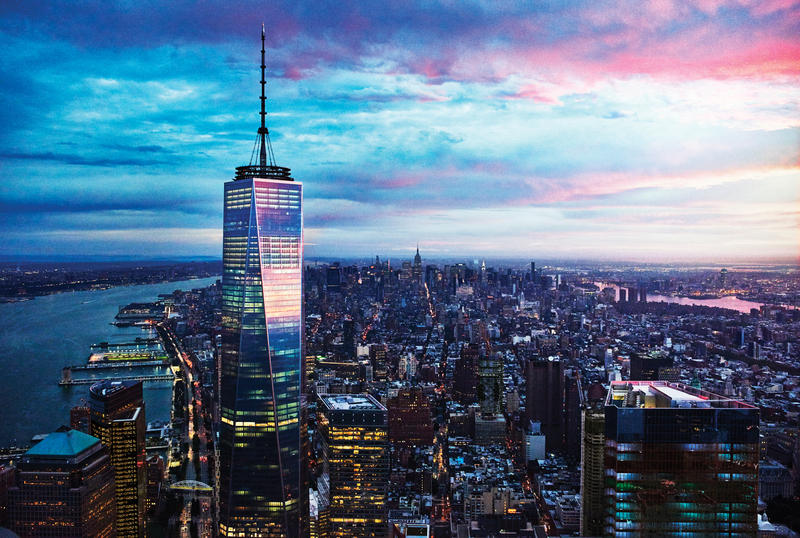 Sunset is the best time to visit One World Observatory, but be prepared for increased crowds. If you prefer a a less crowded experience, visit in the morning or mid-day. 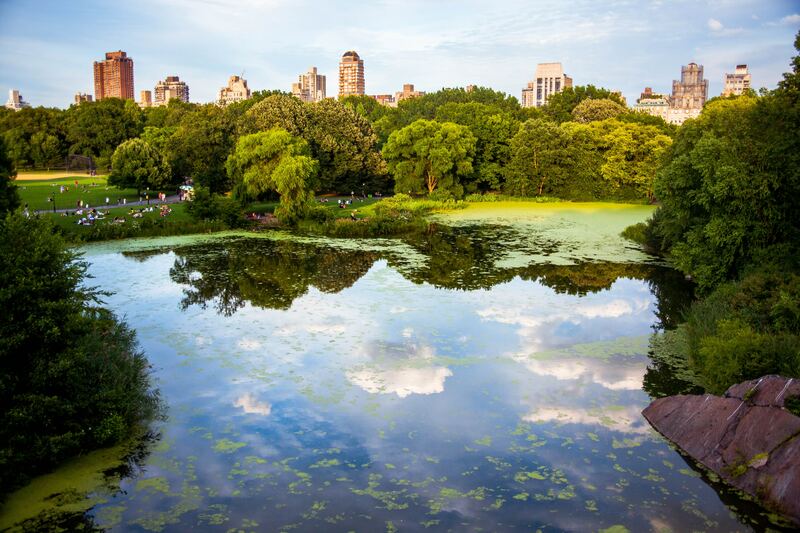 Museums, Central Park, luxury shopping – that is Uptown Manhattan. For this part of your trip, prepare to do a lot of walking, comfortable shoes are essential. Central Park was created in 1857 by Frederick Law Olmstead to accommodate the fast-growing population of New York City. The park has since served as an urban oasis for residents as well as a popular attraction for visitors. Central Park is massive, spanning from 60th st to 110th street between 4 avenues. It would be quite the undertaking to see all of Central Park in one day so we recommend taking a walking tour or a bike tour. If you’d rather explore on your own, you can rent bikes from multiple vendors around the park. 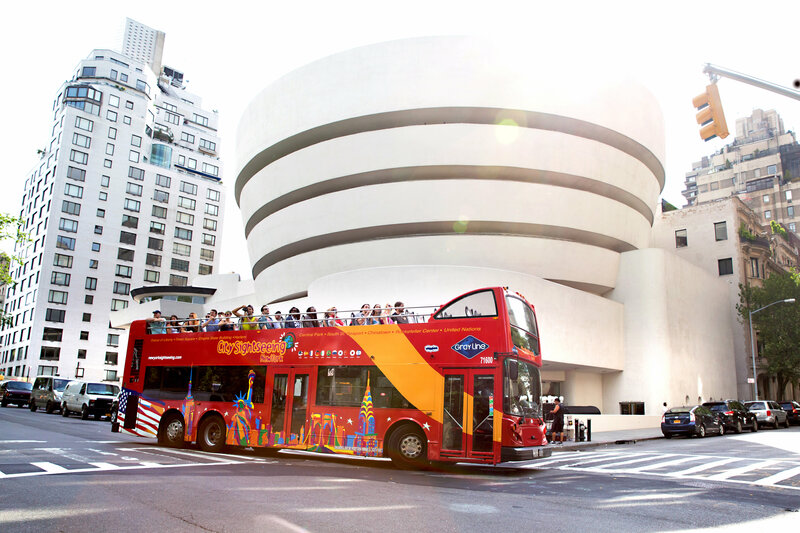 As an alternative to walking around, you can take the CitySightseeing Uptown loop, and go around Central Park, taking in everything from the architecture, different neighborhoods in Harlem and the Upper West side, as well as the history and stories of each, all from the comfort of an open-top double-decker bus. The CitySightseeing bus is included in the SightSeeing Pass for up to 7 days (matching the pass duration of your Unlimited Pass), or as a choice with your Flex Pass. This giant Upper West Side museum is the perfect way to spend a morning or an afternoon with your kids. 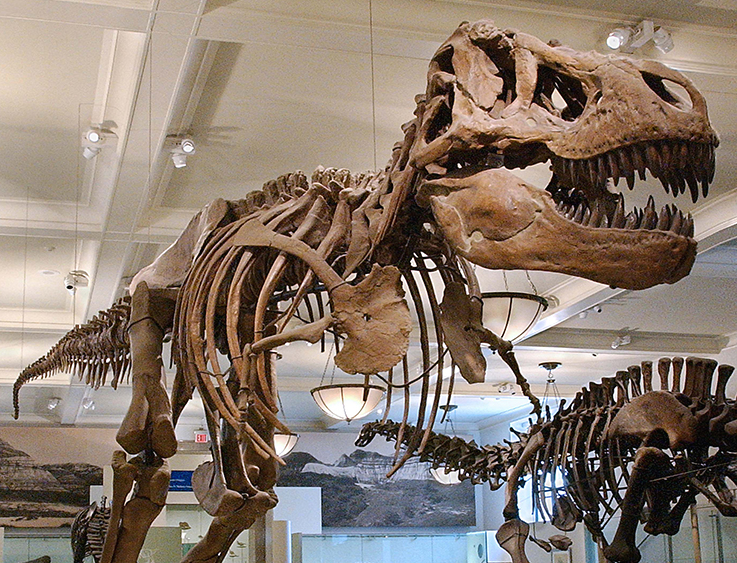 The famous T-Rex skeleton is as captivating as the rest of the educational content of the museum. American Museum of Natural History is committed to teaching kids and adults about the evolution of our planet and its inhabitants. For a little extra charge, you can venture outside of the Earth at the Hayden Planetarium. After you’re done exploring the AMNH and the West Side of Central Park, walk through to the East Side, where you will find the Museum Mile. The Museum Mile stretches for about a mile along 5th avenue on the East side of the park and consists of El Museo del Barrio, the Museum of the City of New York, the Jewish Museum, Cooper Hewitt, Solomon R. Guggenheim Museum, the Neue Gallerie and the Metropolitan Museum of Art. 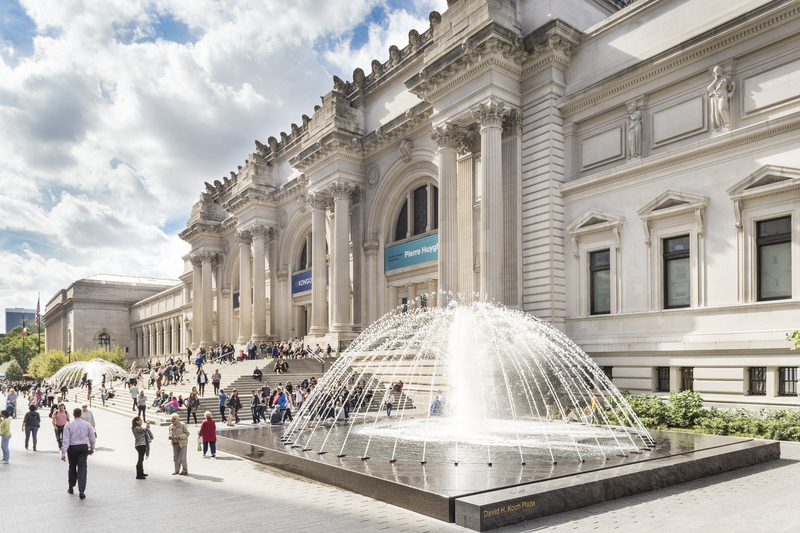 The Met is one of the largest and most visited art museums in the world and is a definite must-see. Spend some time here getting acquainted with the art and the venue, it’s truly massive and offers limitless possibilities for exploration. If you want to explore even more art, the Met has two more locations, the Cloisters in Inwood dedicated to Medieval European art, and the Met Breuer, a contemporary art space on Madison Avenue. If you have some extra time and you’d like to get a little bit off the beaten path, you should explore less touristy areas of Manhhattan like SoHo (great shopping), the Village (exquisite restaurants and celebrity sightings in West Village and vibrant night life in East Village), Harlem or the Meatpacking District (home of the Whitney and the High Line). 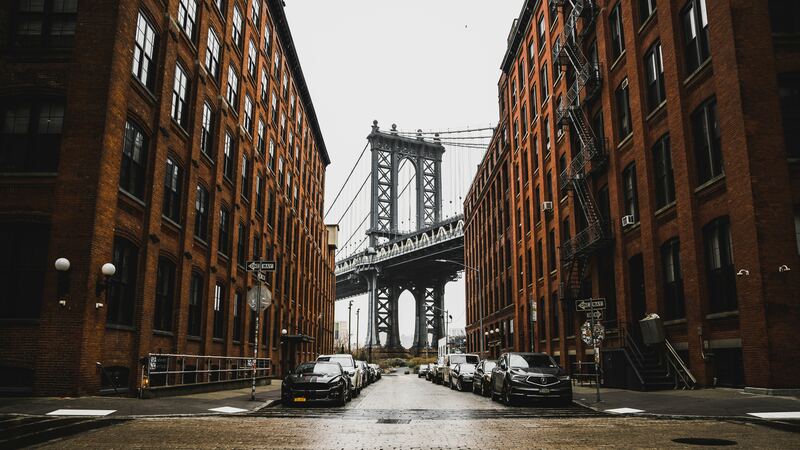 Outside of Manhattan, we recommend checking out South Bronx and Arthur Avenue, a classic Italian neighborhood North of Manhattan, Brooklyn Heights and DUMBO across the East River, or Long Island City, MoMA PS1 and Flushing Meadows – Corona Park in Queens. In New York City, the best way to get around is usually the Subway. It can seem a little daunting at first, but it actually makes sense. Most of the subway lines run 24/7 pretty frequently, so there’s no need for a schedule. The only thing you need to understand the subway is the Subway Map. Cabs, Uber and other ride share programs are also popular. Uber and Lyft work the same way they do everywhere, you call one via an app on your phone. Hailing a yellow cab works pretty much how you see it in movies, it’s easier in Manhattan, especially on busy avenues. If you take an Uber, you do not have to leave a tip, but if you ride a regular taxi, tips are customary. Prepare to do a lot of walking, even if you’re equipped with a MetroCard and a fistful of cash. NYC is a walking city and a lot of transportation happens on foot. Whatever you do, try not to drive in Manhattan, the traffic is really bad and parking is a headache. You will end up wasting time stuck in gridlocked traffic or trying to find a parking garage that won’t financially ruin you. If you are driving into the city, leave your car somewhere Uptown or in Brooklyn and take the subway around. If you aren’t short on time, a good way to get around, while getting an education, is the CitySightseeing Hop-on, hop-off bus. There are three loops to take you around Downtown, Uptown and Brooklyn for the number of days you choose. If you need any more hotel inspiration, check Time Out’s Best Hotels in NYC. New York City is a prime foodie destination and as such, it has an overwhelming number of restaurants to choose from. A good way to search is by checking Eater’s 38 Essential New York Restaurants or check OpenTable and make reservations anywhere you’d like. Time Out New York is one of the best resources for New Yorkers and visitors for frequently updated lists of things to do, events, attractions and more. For neighborhood guides, tips, maps and other tourism information, check NYCGO.